Did you know that solar radiation from the sun can purify (disinfect) water and make it safe for drinking from harmful bacteria? 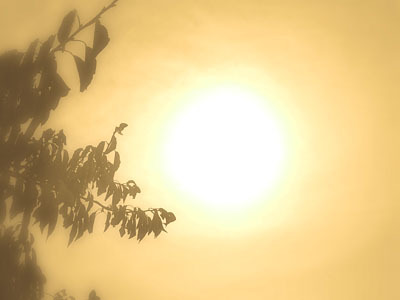 While so often we hear or read about the bad things that the sun is capable of doing to us, we should also know that some of the same energy from the sun can be harnessed for doing good. A few good examples include solar electric panels, solar hot water panels, and solar ovens. A clear plastic bottle filled with water, exposed to the sun for 6 hours will make the water safe to drink (see the caveat list). In fact, the effectiveness of terminating harmful bacteria is an amazing 5-Nines, that is, 99.999 percent! This method kills germs. If the water is already contaminated with chemicals from pollution, the chemicals will remain. If the water is cloudy and dirty, it should be filtered first to allow the UV-A rays to effectively penetrate into the water. The plastic water bottle should be no bigger than 2 liters. In moderately cloudy water, UV-A will lose 50 percent effectiveness at a depth of 10 mm (about 0.5 inch), whereas UV-A will only lose 25 percent effectiveness at a depth of 10 mm in clear water. Just use a typical size soda bottle or water bottle. The recommended bottle to use is a “PET” bottle. It is very common and is typically used for soda or other soft drinks. PET, PolyEthylene Terephthalate, Recycle code #1 on bottom of bottle. The bottle must not be colored. It must be a clear bottle. Again, it should be a clear plastic bottle. Some types of glass will block too much of the UV-A spectrum for this purpose. Different types of glass have different chemical and physical properties. Certain types (e.g., quartz glass) have a very high transmittance for UV radiation, while other types (e.g., window glass) effectively filter out this part of the solar spectrum. All commercial glass bottles used for beverages that were tested so far at Eawag had a UV transmittance comparable to PET bottles, and were, thus, suitable for SODIS. No differences were found in studies of glass and PET bottles that compared their SODIS effectiveness. It is possible, however, that certain glass bottles available in target countries have different UV transmittance properties, and we recommend testing UV transmittance of locally available bottles before promoting them widely for SODIS use. Glass bottles also have certain disadvantages compared to PET bottles which include their greater weight and risk of breaking, limited availability in suitable sizes, and the lack of reusable caps. The bottle must be clean. Common Sense. Know your water source (as best you can)… if you believe it to be chemically toxic, don’t use it. Fill the bottle with water. If the water is very cloudy, it must be filtered by first pouring through a cloth or such material to capture sediment. Lay the bottle down in the sun. Do not stand them up. Ideally the bottles would by placed so that they face the the sun at a similar angle, to maximize the UV-A penetration. 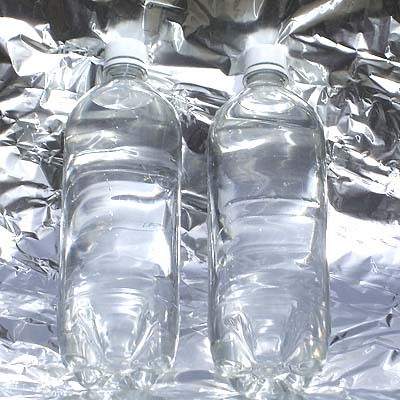 Even better… lie the bottles on a reflective surface to increase the UV-A exposure using direct and reflected sunlight. This is not necessary, however it would shorten the required time and ensure optimum UV-A exposure. If the sky is partly cloudy with only a few clouds, then 6 hours sunlight exposure will be enough. If the sky is half filled with clouds, or more, then 2 days will be required. Note that the outdoor temperature does not matter, so long as the UV-A sunlight exposure has been 6 hours. Swiss Federal Institute of Aquatic Sciences and Technology. For those that are concerned about using plastic, the WHO (World Health Organization) states that the limiting values (plasticizers) for drinking water are never exceeded when using PET bottles for this method. Sediment or other particulate matter should be removed first by a filtering process. Solar water disinfection if performed correctly will eliminate organic contaminants from impure water. Water that contains non-biological contaminants (heavy metals, etc..) may require filtering. One of the best drinking water filters today is the Berkey drinking water filter. Consider this: I sometimes collect cans walking alongside the road. I will from time to time see a water bottle with some unknown slightly yellow liquid in it. I understand that sometimes truckers have been known to relieve themselves by peeing in a water bottle and throwing it out the window. This bottle sits in the sun and based on your article it is safe to drink! Is it!! Would you drink it? Well, my point is if you have to purify or sterilize the water then you are not sure of it’s source (downstream from a sewer or leaky septic system, etc.) or what is in it. Would you drink it after it sat in the sun for 10 hours? In my opinion, someone would have to be VERY desperate to drink a bottle filled with liquid from an unknown source as described in your hypothetical example. NOT recommended. Most people have the common sense not to pick up a bottle filled with yellow colored liquid on the side of the road, and drink it. Would you?? The use-case for solar water purification spelled out in this article is for purification of water from a known source (e.g. a river, lake, stream, etc.) It is a proven fact that solar UV water purification works as described in the post, and is commonly used in many third-world regions. In fact, UV water purification is beginning to be implemented in several municipalities around the US and is currently being used in many developing or poor areas around the globe to help fight disease. You should never drink the water if you are unsure if it may be chemically contaminated in any way. Hahaha! The problem is… I think that it would take awhile to purify that particular water! The article did say very clearly to know the source of your water, meaning if you’re near a lake, don’t go looking for piss on the freeway. And secondly if you’re going to get all technical about it, urine is sterile unless you contaminate it with something else and people have had to drink it in extreme survival situations because they had nothing else available in lived. And thirdly nobody is dumb enough to pick up trucker bombs off the freeway to drink if they have Any Other Option. This summer I noticed a larger than normal amount of dragonflies around the property down by my cabin. I already knew they’re harmless to humans and they eat lots of insects especially mosquitos and gnats. So after seeing so many I decided to look up more info on them just out of curiosity. Well there’s lots of interesting stuff about them, but getting back to the subject of knowing your source of water. One tidbit I learned about them is that just like mosquitos they’re hatched in the water and if the water source is chemically contaminated even slightly they won’t survive because they are very sensitive biologically. So ponds and lakes with a good population of dragonflies are a very good sign of non-contamination. This however only covers chemical contamination, I would still purify for bacteria and viruses. This also would not be a good test for people on the move but more of a good sign of the water in the area around your home. There is a great show on the Blaze called Independence USA. It’s a reality show about this family that does survival planning and are trying to become self sufficient. They set up a rain water collection system to get water for their garden and to drink. Obviously, they were concerned with how to purify it for drinking. They used this very method. They built a lean to with shiny corrugated aluminum. The bottles stacked up quite neatly on the aluminum. The interesting part was that they actually sent samples of the raw rain water and the purified rain water to be tested. They also had their well water tested. The water that was unpurified had multiple types of dangerous bacteria in it, but the water that was purified had 0 bacteria left in it. By the way, the water that was purified by this method was even cleaner than their well water. @Linda, Thanks for sharing that and reaffirming the method. It is amazingly simple to purify water using this method, and is a very powerful bit of knowledge to know about, should you ever need it. The only caution (the same caution as most other methods) is that this will not remove chemicals that may already be in the water). Years ago when I was in the Army we were taught in the Operating Room Tech class that a field expedient method of disinfecting blankets, mattresses and linen was to place them in direct sunlight for 8 hours. So there is a basis in history for this. The Amish also use this method,drying their clothes outside..ALL day. They may not bring them in until needed. I haven’t read all the comments yet, but has anyone mentioned the fact that heat brings out the toxins in plastic? I would use glass, in any case! Glass blocks UV quite well and cannot be used for sodis purification. I am not that keen on bpa from water bottles either but it beats the hell out of an intestinal tract full of typhoid. This system is appropriate in emergencies to treat good quality clear water. It is a reasonable way to remove doubts, not heavy contamination. Use bpa free plastic bottles (available at rip off rates from health food shops) if you are concerned. They must be clear, not tinted or too thick. Yip, drinking water from plastic is bad, drinking water from a plastic bottle that’s been in the sun for 6 hours will be really bad for you !! This document must of been written by the government? This is done in third world countries all the time (purify water with sunlight) and has saved countless lives from waterborne disease. Do a web search on SODIS for more information. In a survival situation, you will be dead without drinking water within about 3 days. Drinking water purified from the sun in a BPA-free plastic bottle, or possibly dieing of thirst or dehydration from a waterborne illness? The bottle wins. At least for me (in that scenario). @Rainy Hartt, You do know that that is a complete falsehood/hoax, right? Of course you don’t. Don’t believe everything you read on social media. Plastic bottles are fine to use and reuse, so long as the weren’t used to store harmful chemicals first. This is an urban legend. There are no dioxins in plastics. In addition, freezing actually works against the release of chemicals. Chemicals do not diffuse as readily in cold temperatures, which would limit chemical release if there were dioxins in plastic, and we don’t think there are. Have you researched WHO at all? I would guess no or that you haven’t researched them enough. WHO is a globalist, agenda 21 proponent. They have championed Monsanto products and techniques worldwide, as they’ve been lobbied to do so. Not only for the money, but because such products will also further their intent of population control . They are a proven corrupt agency that is so discredited, I would almost be more comfortable doing the exact opposite of anything they’d suggest to do. I know you didn’t cite them directly, but others did and you came with a laundry list of government agencies that are motivated predominantly by $, greed, and control. Any time one cites WHO, the American Cancer Society, or similar agencies to back up a claim relating to their respective subjects, it is apparent said person is either gravely misinformed, brainwashed/indoctrinated by the powers that be, or works for such an entity themselves. To believe the American Cancer Society when they say plastic water bottles left in the sun will not leach cancerous chemicals into the water, would be akin to believing the candy man who claims one could eat candy all day, every day and never get diabetes… Then the Dr who backs this man up because of all the money he or she is about to make from a lifetime of treating this future diabetes case. The ACS, like big pharma and many doctors, enjoy the riches of a multi-billion $ a year industry via perpetuation and the subsequent treatment of these diseases, infections, and illnesses. It’s all about the $ and control, and said motivations on such an impersonal, greedy, and vast scale should never be trusted. Please don’t take my word for it, but research for and enlighten yourself. And people reading this article, please further your comprehension of this subject by googling “sun-charged water”. There are more benefits to this practice beyond that of simple purification… Nothing but glass should ever be used. Creating UV-blocking glass is an expensive process and never done unless necessary, i.e windows, etc. Never performed on glass designed to hold potable liquids. By the way, no one ever mentioned a thing about freezing water in plastic here. You’re either paid by these corrupted entities or you’ve simply copied and pasted chunks of indoctri-wikidpedia. If not paid by, time to break free of any blind faith you may have in. Be that as it may Tom, even if those plastic bottle do release chemicals into the water it might kill you in decades. Diarrhea can kill you in a week. For an emergency situation where clean water is needed SODIS is worth the risk. Water contaminated to a limited extent can be purified by this technique. in an emergency I can foresee having to drink water from our farm pond , It is up to thirty ft deep and is fairly clear for SE Kansas. However I know that there is a potential for several contaminates so it would need some form of purification . A jug of bleach isn’t going to last for ever so solar means should be a plan. Once you have to construct an absurd scenario…..re-read the article. Violently arguing against a claim never made is annoying. It anything, use a glass mason jar with a cloth over it, but DO NOT use a plastic bottle. I honestly can’t believe that this article tells you to do so. Even leaving a plastic water bottle in a car in the shade on a hot day is bad. The plastic (& many chemicals from the plastic) literally leaks into your water & you drink all those harmful things without even knowing. Very unhealthy. Glass may be safer in the long term, yes. But for you to say “Don’t use a plastic bottle” – as though if you do it will be the end of you – is wrong. Glass may be a better option, but given the widespread availability of plastic water bottles, they may be more available in a survival situation if one were in need to purify water (with sunlight). When it comes to SHTF survival, the issues of long term effects from (the possibility) of leaching (even though the plastic is considered food grade) is miniscule in comparison to the need for water itself. You will die without any water after 3 days (more or less). How long will (the possibility) of leaching take before it affects you? Maybe decades? Maybe never? “Don’t sweat it.” Just store some water! Please do not share ignorance as if it were fact. This method has been tested carefully and is WHO approved – it will not leach cancer-causing chemicals into the water (you could at least consult google before you post with such authority). PET plastic was specially developed to be safe for storage of food and water. Look for the 1 Recycle number and use the sun to purify your water. Glass, in contrast, often blocks UV rays. So no, if you use glass you will not die of cancer in 15 years, because you will die of cholera tomorrow. Any time one cites WHO, the American Cancer Society, or similar agencies to back up a claim relating to their respective subjects, it is apparent said person is either gravely misinformed or brainwashed by the powers that be, or works for such an entity themselves. To believe the American Cancer Society when they say plastic water bottles left in the sun will not leach cancerous chemicals into the water, would be akin to believing a candy man who claimed one could eat candy all day, every day and never get diabetes. The ACS, like big pharma and many doctors, enjoy the riches of a multi-billion $ a year industry via perpetuation and the subsequent treatment of these diseases and illnesses. It’s all about the $ and control, and said motivations on such an impersonal, greedy, and vast scale should never be trusted. Please don’t take my word for it, but research for and enlighten yourself. And people reading this article, please further your comprehension of this subject by googling “sun-charged water”. There are more benefits to this practice beyond that of simple purification, and nothing but glass should ever be used. Creating UV-blocking glass is an expensive process and never done unless necessary, i.e windows, etc. Never in glass designed to hold potable liquids. The person who wrote ‘don’t use a plastic bottle’ is a moron. PBA will be the very least of your worries if you don’t have water. Have a few coffee filters on hand to filter dirty water. Cut the top off of one of your bottles, making a short funnel. You can put the coffee filter in the funnel and filter water into the lower part of the bottle you just cut. Pour that clean water into an empty bottle and let the sun’s UV cook away for 6 hours. they say soda stored in plastic bottles for months have a lot of leakage, drinking the purified water wont be the same because you would drink it in a shorter amount of time. If you read the article, DO NOT use a Mason jar or other glass container, glass filters out UV which is what you want. Food grade plastic is fine for solar purification if it is BPA free, PET is safe as well. 55 years ago I got my first 5 gallon aquarium and would buy tropical fish. I use to get my fish from someone who raised them in his back shed. Only being 10 years old, I did not have money for the purification tabs and such but the guy told me to fill a “gallon” jug (only glass back then) and leave it in the sun for 24 hours, and it would remove the chlorine. Never lost a fish! I am tired of paying for water and hate the chlorine put in by the water co. I am thinking it will work with glass but would take longer because of the depth and the jugs I have are slightly tinted green? Thoughts? That said, this article is describing decontamination of organic pathogens by utilizing the UV-A wavelengths of natural light from the sun. Early on, it had been suggested by the SODIS organization that glass (especially colored glass) will inhibit those wavelengths (to an extent) from penetrating the glass into the water. This is why plastic bottles apparently work so much better – they allow that part of the light spectrum to penetrate through without issue compared with glass. UV-filtering glass is an expensive technique that is not financially practical and never performed unless the application of is necessary, i.e. windows, etc. This process in never performed on glass designed to contain potable liquids. Companies producing glass containers for whatever drink it may hold would go bankrupt if they had to add a UV-filtering layer to their glass. The profit margin on such products is not high enough to allow this completely unnecessary, additional step, and it would be frivolous undertaking in the first place. I just don’t understand why intelligent people post overgeneralized comments without taking into context and applying critical thought or common sense to the very specific subject at hand. Very informative article; good to know (esp the caveats) if you get stuck somewhere without a water purification method or means to boil water. Thanks for the article. I have tried this method while out camping in Idaho. I took the water from a fast flowing stream and placed the 16 ounce bottles on a folded out piece of tinfoil. I did this as to use my time well as I was building an A frame shelter. I figured why not try it and also it was using my time more efficiently. I drank the water later that evening in my shelter after the water was in the sun for 7 hours. I never got sick. I’m sure it worked. For those that scoff at this method, I say something tried is better then doing nothing. What a fantastic article thank you so much for printing it!! Its amazing to think that it really could be as simple as that. Thank you so very much for your information. it does ease my mind knowing I can produce clean water. In these day’s we need to know how to survive. Knowledge is power. God Bless You all. I think the title should be : How to sterilize water with sunlight. As if there is sand or something not alive inside , you don’t get it out with sunlight. Just imagine if the water has snake poison. it will not get purified with Radiation of the sun. Another solution is to boil the water , it will kill most of these bacterias. True enough, the word “purify” might be a bit strong in this context. Sediment would need to be filtered by a separate process. I’ve added a note at the end of the article to state that the word “disinfect” is probably more appropriate. As mentioned in the article under caveats, if the water source is already contaminated with toxins or chemicals, these toxins will remain. The plastic sheet distiller system is safer. Make a tent of thin plastic sheet over a bowl of filtered( a sandy sox will do). The water in the bowl will evaporate in the sun and turn into drops on the plastic sheet. Arrange a cleen spout for the drops to run into a collecting cup and you will have distilled water. Plastic sheet distilling is good to purify but if you only need disinfection, then sun UV exposure can be used to quickly treat the water you have on hand. This works, I’ve been drinking water that is placed in the sun for about three years and it has never made me ill. Its only common sense that you have to clear the water before you start killing out the micro- bacteria. To many commercial products on the market don’t want you to know this because they want to sell their goods. My only concern is the BPA found in plastic. It becomes more of a threat when warmed (out in the sun). So you may have purified it, but you’ve also just leached BPA into it. I would be cognizant of this, yes. In the context though of ‘surviving’, and using this method as a means to disinfect water for drinking, I would rather take my chances with a ‘potential’ long term affect from BPA leaching from the plastic, than getting sick from ‘bad’ water. I get your point though. The method Ken describes does work. Do a Wiki on SODIS. Would not be my first choice. While I agree that BPA is a bad thing; bad, or no, drinking water is far worse. BPA occurs in certain #7 plastics. #1 thru #6 plastics “are very unlikely to contain BPA” according to hhs.gov/safety/bpa/. Regardless I would protect bottles from sunlight when not in use to minimize leaching. Wonderful article! Do you know if a glass blottle will work in this situation? Most glass bottles block a portion of the UV band, however most ‘should’ work okay – so long as the glass is clear (not color shaded). Some types of glass (purpose-made UV-blocking window glass) will block some of the UV, but most clear glass bottles are apparently okay. Several people have pointed out the flaws they see–obviously this is not a best case scenario course of action. Sheltering outdoors in cold weather and killing your pets for food aren’t great options either, but given the alternatives they make sense in survival situations. You got it exactly right. It may not be your first choice, but it’s a choice. The more options we have (and know about), the better. Interesting to learn this. If you happened to have a glass bottle on hand, is there any reason why that would not work instead of plastic? @Elaine, Some glass blocks a portion of the ultraviolet band (UV-B), depending on the glass manufacture itself. Having said that, most clear glass bottles should be okay for UV water purification because normal clear glass is mostly transparent to the ultraviolet band (UV-A, to 330 nm), allowing 80% of the band’s radiation to pass through (UVA penetration is needed for water purification). Clear plastic beverage bottles (e.g. #1 PETE) assures near 100% UV penetration. Also, if the glass is real thick, it will not be as effective. Thanks for the article didn’t know that. I alsways though it was a full day in direct sunlight. This makes sense since I can purify water in my Global Sun Oven and I never thought to just leave a bottle in the sun. Great idea! I use canning Mason jars and a WAPI in my sun oven. The WAPI came with my sun oven and even using glass it works to purify the water. Wouldn’t the glass jars also work outside of the sun oven? @Julene, Yes, as indicated in the article, you simply need to expose the water to sunlight for a full 6 hours (no clouds), but the caveat is to use food-grade plastic bottles. I intend to research the UV reduction effects if one chooses to use a glass container instead, and will hopefully come up with a suggestion regarding the increased time required for clear glass. I also have a Global Sun Oven, and we love it. Thank you so very much for all your wonderful information! You can also use a Zipock bag instead of a water bottle. If you get the large sized bags, you can lay them out flat and you get a greater surface area with a shallower depth for the sun to penetrate. Ziplock bags do not contain BPA’s. That’s a great suggestion Joe. Plus empty Ziplock bags don’t take up much space vs. the same amount of water that would require ‘hard’ containers. If you fall on a Nalgene bottle, full of water, you say a few choice words and get up dry. They come in clear, non BPA plastic. If you fall on a Ziplock bag, full of water, you say a few choice words and get up wet. A condom does have the advantage of being more elastic. Less likely to break the condom or your ribs. On the down side they probably block a certain amount of UV. On the up side socially, per Cody Lundin, this option allows you to go to the store and request a box of the largest and strongest condoms they carry. ROTFLMAO. Well, the ziplock bag is not for transporting water actually. This article is talking about filtering your water with the solar exposure method and the time involved to do so, which is 6 hours. So you could probably only use the solar method, weather you use a bottle or ziplock bag, when you have the opportunity to stay put for 6 hours and let the sun do its work. So, in that situation a ziplock bag would work very well. Actually, I bet you could affix a bottle/ziploc to the top of your pack if you were on foot all day in the sunlight. And I buy the Magnums anyway.. The ziplock bag purification can work well during hurricane season at home too. I imagine that I dont want to use up all my coal to boil drinking water during a power outage. I can lay bags of water on foil in the sun all day and let it cool off all night to have cool drinking water the next morning. Rain water can be collected if needed. Survival is not just for campers and wilderness folks. Some of us will need to survive right where you are at home. I would add some gallon or quart size ziplock freezer bags and some foil to my hurricane kit, and the directions to purify water with it. but plastics that get hot can leach harmful cancer causing toxins into our food/water that have been found in breast cancer. So this is a good idea but should definitely be done in something other than plastic unless it’s an emergency situation. I agree that long-term usage of plastics may contribute to risks of follow-on health issues, although many plastics are now claimed to be ‘BPA-free’. Having said that, and since this is an emergency survival preparedness site, it is a very valid and potentially life saving method to purify water. My wife, myself and my daughter are getting ready buy a piece of property and and take a stab at living independently off the grid. We are selling our house and everything we own, except what we know we’re going to need for construction, and starting out, buy a piece of property with a stream on it. We will raise Chickens, (eggs) Goats(milk and meat) and Rabbits(fertilizer and meat) as well as a lifetime hunting, fishing license, and grow and dehydrate our own vegetables. We plan to excavate a giant living space into a southern facing hillside and shore the heck out of it. We have been looking at a lot of alternative energy sources but the one thing that concerned me was purifying our drinking water. If we build a large straining system with cloth at he bottom then a layer of charcoal, then sand on top of that, with a layer of small stones on top it will sufficiently strain out and eliminate many of the harmful natural pollutants. This method would be relatively easy to purify 10, 3 gallon water containers a day and that would be plenty of drinking and cooking water for the three of us. The water would not have to be so strictly managed for laundry or showering. This article has been very helpful in the final stage of our plan. I saw a segment on TV where they ran the water through an intense UV light to purify it instantly. I can’t remember if it was a laser or just an intense lighting source. I will try to locate the info and get back to you. While this method won’t get you clean water, a great way to get both vegetables and protein is using aquaponics – vegetables and fish working together. Your article is a bit off – there’s ample research that shows that glass bottles or jars work just as well as PET bottles, without the potential for harmful chemicals leaching into the water. The only caveat is the the glass must be less than 2mm thick. Additionally, the best method for SODIS is using SODIS bags – they’re more efficient than PET or glass containers, purify the water faster, and take up far less space. Can you use milk jug bottles? I want to try this..here in the southwest desert the sun always shines. I would expect that glass milk jugs would work, as I’m fairly confident that they are not treated to prevent ultraviolet light from penetrating. Plastic milk jugs are not clear, and will not work. Purify Water with Sunlight – Glass or Plastic? I noticed a lot of the plastic vs glass. I know people have been more concerned with BPA from their water bottles and have been making more BPA free water bottles. As long as they were clear, wouldn’t that be a better solution. Doesn’t give you the harmful BPA but still allows all the UV rays through to fully purify the water. Thank you for providing this critical information! You shoud know better, that PET (PETE) is very harmfull. Especially on sunlight. PET packaging realises CARCINOGENS on heat or light exposure. There are some good plastics like PP, but the most safe is GLASS. People, WAKE UP! We live in information age, ingnorance is not an option! The last time that I checked (about 1 minute ago), ALL of my store bought water bottles are PETE plastic. As far as I know, EVERY store bought water bottle is of PETE. So if your claim is true, then why aren’t we all dead? Hmmmmmmm? I’m not arguing that glass is not a better or safer container in the long run, which it is, but I believe that you might be over reacting on the PETE thing. Look around, Jack. A lot of us ARE. While researching ‘sterilizing water with sunlight’ I found most people recommend plastic – but you are correct, PET plastic is unstable ESPECIALLY in sunlight, they release carcinogens I always use glass, for cooking, food storage, everything. If it were a matter of ultimate survival I would use plastic, but while I have glass, I will always use that. I use the sun to sterilise water from my rain water tanks. Recent studies have shown that reusing bottles made of PET can in fact be dangerous. PET was found to break down over time and leach into the beverage when the bottles were reused. The toxin DEHA also appeared in the water sample from reused water bottles. DEHA has been shown to cause liver problems, other possible reproductive difficulties, and is suspected to cause cancer in humans. Therefore, it’s best to recycle these bottles without reusing them. Hi, where is that study about re-used PET bottles hazardous effects? Thank you! I fill gallon glass bottles that apple juice comes in with tap water. The tap water has a very unpleasant chlorine taste to it. I place the filled bottles at about a 45 degree angle in full sun. i don’t keep track of the time a bottle is in the sun. There are 12 of them. I use & replenish as needed, typically two to three bottles a day. So they would get about 4 days sun exposure. The water tastes good, like what I remember it tasted like when I was a child. I haven’t had it tested, but plan to get to that eventually, but the taste tells me that the sun is purifying it enough to render it palatable. much faster just to boil it first I would think? Yes, absolutely. However it is good for people to know alternatives, wouldn’t you think? of the points for using sun. Beyond the cost of containers, it is free. So, which glass bottles are less than 2mm and clear? what about BPA I hear about how it causes cancer so I’m afraid to try it. The information in Ken’s article is often called the Soldis method i.e. solar disinfection. It’s one of the primary ways in which water is purified in 3rd world countries with a lack of organized water treatment. It definitely plays an important routine role in disinfecting water but an inexpensive method. While I would assume that most preppers have at least some short term methods in disinfecting and purifying water, I would bet that far too many have made a lot of assumptions about water collection locally from their water sources. Honestly, there is practically no more important prep, and it’s great to know multiple ways to purify water. The Soldis method can be taught to others who haven’t prepped too. The more that you help the survivors in a collapse or a disaster, the better off your own family’s survival (up to a point). Why? The more secure they are, the less conflict there will be within your neighborhood. The less conflict, the easier it is to organize the neighborhood survivors into agriculural efforts. In history, very few folks remained isolated. Tribes rose up through cooperation. It takes a lot of people to raise crops and animals, harvest them, preserve them, tend them when diseased, build wells, etc. Without organization there is no education and no medicine. Knowing some practical beginning prepper ideas like Soldis, might be ways to facilitate struggling folks in your area. If you are the shaman who knows how to save lives, then that will often earn their respect, and in so doing might help the struggling teacher, priest/pastor, and healer that isn’t so prepared but has essential knowledge that YOU don’t possess. Soldis is definitely a great interim step, as is rainwater harvesting, until a deep well and a Biosand filtration system can be established again. I am trying to design a product which uses uv lamp so that we dont have to keep water in sun for 6 hours. Is this posible by using some kind of uv -a source , for eg a uv lamp. Great article and great comments. I picked up a few things. Thanks. If you have several bottles and the water source is dirty, filter the water as best you can through cloth or whatever you have. Then let the silt settle out overnight to the bottom of the bottles. The next morning carefully pour the clear water off the top through another filter into plastic bottles leaving behind most of the silt. Then start the 8 hour soldis process in the sun with the more clear water. Repeat the process daily to build up your stores. Once purified, extra water can be stored in glass containers for use. Also, colllect your water from fast flowing sources like a turbulent river if possible. The turbulent force oxygenates the water which helps reduce the amount of harmful bacteria and parasites. Note: I said “reduce”, NOT “eliminate”. Still, standing water becomes stagnant and is a breeding ground for bacteria, parasites and all sorts of nasty stuff. The better the source the better the water. Learn all the water filter and purification methods and prepare for a backup if your best choice fails. Remember, if someone breaks into your bugout location they are likely to steal your Big Berkey but will most likely pass by a bag full of empty plastic bottles. Especiall if you leave them a dozen full water bottles to take, leave and go away. In other words, hide your good stuff but always have something to give the bad guys so they will hopefully leave you alive. Guns and ammo are second only to pure water, food and shelter. This will make great water to pour through your Berkey filter if you have one. It will also greatly extend the life of any high tech filter. The only to avoid most chemicals is by distillation and the pure steam process. For this you will need to buy or build a still to get much volume. And what if you only use a foil tray for placing 2″ or 3″ pre-filtered water?. This water takes 100% of UV rays and no risk of BPA. The tray can be made quickly of aluminum foil tray or Stainless Steel tray can be used more regular situations. It is true that water being exposed to the environment can tip some pollution, but will be exposed to UV rays and will always be the option to re-filter the water. I’m glad I came upon this article. Very informative. I hope I never need to rely on this technique, but I feel better knowing it. But the comments! I am lolling hard at all the people who would prefer to definitely die of dehydration today than to possibly die of cancer some years down the line! Modern Survival Blog- the clue is in the title. Thanks for all the excellent information! I have 3 large framed glass mirrors that I was going to take to the thrift store, but now I think I’ll save them for water purification needs. There is a higher degree of reflection from a mirror than aluminum foil, so I think the process should work more effectively when complying with the time and sunlight requirements. I am also planning on using a few 9’x 12′ plastic drop cloths with grommets for capturing rainwater. Do you see any problem with drinking rainwater immediately after capture if it has been raining for a few minutes first, in order to wash off any manufacturing residue before you drink it? The drop cloths are available at Wal-Mart for $7 or $8 bucks. Seems like a good method to secure a quantity of drinking water pretty quickly if it’s raining. What do you think? The water you’ll collect from a tarp will add up quickly! It is an excellent way to capture water. Like you said – so long as the tarp is clean, there should be little to no worries. I just went through my water supplies and realized most of the water is from 2008-2011. The water is in plastic bottles no larger than 16 oz. Should I throw the water away or can I use the UV method you describe? I don’t know how much you have, but, if it were me and the water has been sitting in plastic bottles for 3 to 6 years, I would drain them and throw them out (recycle). UV will not remove chemicals. If it were a SHTF survival situation though, then I would not throw them out! What type plastic bottle? BPA free? Water could be filtered through a slow sand filter system (cheap and easy to build) first and this would remove a lot of impurities, including chemical impurities and then disinfected this way. You must remember this is a disinfection process, NOT a filter process. Well written article. There are many well know ways to filter out visible impurities from water but this is one good method to eliminate some small pathogens that those methods cannot catch if there are no other tools available. Obviously a method of last resort but a good one to remember. Thanks for the information. Many chemical and plant toxins can be identified and avoided by using your sense of smell. I have been made ill by various water pathogens mostly overseas due to the fact that I did not realize a water source or food was contaminated, I survived but it would have been better if I could have avoided it or had an alternate source of clean water. Can’t we use black coloured bottle for SODIS method ? I’m not sure, but don’t think so. SODIS uses UV rays to kill pathogens. You *might* get enough heat with a dark container to do so. you cant use colored plastics they block the uv-a light like glass would block some of it too. First, there’s more to be tested than bacteria… How about heavy metals, etc, like what they are spraying in the atmosphere because of “global warming”? (Not). They are spraying aluminum, barium, strontium, and more, which of course ends up in rain water. Also, we are advised not to drink out of plastic bottles that have sat in our cars in the sun, because of hormone-like substances that leach from the plastic. I am researching something I saw being done many years ago by some friends who were into natural diet, etc. They purified their water in one gallon green glass bottles recycled from sites that recycle according to the color of the glass (wine bottles). TO YOUR HEALTH!! People are Morons who state to not use plastic bottles vs from dying of dehydration! ! This article is for survival people! Very informative. I heard that if I store this water on concrete floor, that something in the concrete ruins the water. Any ideas about this. storing up my water for a time of disaster. RCA , the info I have read says put the water on a board of some kind. that chemicals from concrete can leech thru plastics, even barrels. This might sound like a silly question.. but I live in the UK and it’s always raining these days.. today it’s just really cloudy and dark and it’s only 10am. Is there any point in trying to purify water here?? Purifying? If you are going to drink or cook with the water, and don’t want bird poop in it, yes…but you may need to plan on filtering and boiling when overcast. Does solar UVA purify the top layer of lakes? Yes, but since the water in the lake is always moving and mixing form convection or drainage in/out you cannot capture the purified water. Thank you for the information! I have seen this kind of information in various websites but you have the best information available! Thank you! I just wonder do you have any scientific papers and studies to prove this? @Atte, Yes, just do a web-search on SODIS for more information. There is a link in the article with more information. Very informative. I found this while googling about removing chlorine from water for my pet turtles. I wonder if it can be done with a gallon jug, and how long it would require sunlight. Also, would I need to leave the cap off in order for the gas to escape? Thanks so much! I’ve been using uv to treat river water on 3 – 4 day (+) hikes / tramps for months now without any issue. Where the water has been murky I’ve filtered this prior to uv treatment. This article has confirmed I’m on the right path and this will not change. To be clear though I have not used the method described above however, I would certainly use it where options were otherwise limited. I use a uv purification system attached to my drink bottle. Beats the hell out of adding another 15kg in weight to my pack in water alone. Thanks for sharing your real-world experience, and thankyou for your service. NEVER USE PLASTIC !!! … ONLY GLASS JUGS. Judith, The SODIS method of water purification was heavily implemented for 3rd-world regions. Plastic containers are easy to come by, they are light weight and they are made BPA-free. The perceived issues with today’s BPA-free plastics are insignificant compared to dying from water borne illness. Glass though is clearly safe as a drinking water container. Albeit heavier and risk of breakage. This is a survival blog right? The normal among us will do quite well. When we’re all scrounging I will gladly trade my few glass bottles for a grocery bag full of your scrounged crappy plastic water bottles. But you must promise not to ask for my water days later when your tolerance for perceived toxins finally exceeds your thirst. That said I’d trade you some sterilized water for some food or fuel. Mike,yep! They will be drinking out of mud puddles after a couple of days!LOL! I have taught people and used water that has been UV’D by the sun in plastic bottles. They are using that system (SODIS) all over the third world countries to stem illness/death from unsafe water. Hey Mike,stick around. Always good to hear from folks who are knowledgeable. Yaree, ..materials for doing the SODIS water purification method… CLEAN glass (wine bottles work good) bottles or plastic bottles like gatorade/powerade come in… fill with filtered water , (use t shirt, to filter, to get the leaves, trash out..) . put in bottle put in sunshine…That is the procedure, must be in sun for a specific amount of time… look it up. SODIS method,That’s what I have to do.